Mr. Forde has been living in very challenging conditions at his Lot 3, Pipers Avenue, Lodge Hill, St Michael, residence. The chattel home consists of two bedrooms and a kitchen/dining room but had no bathroom facilities, forcing Mr. Forde to use an exposed outdoor facility. 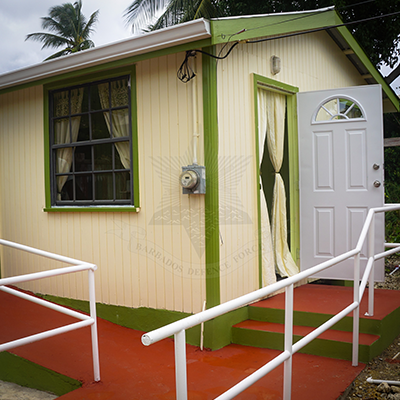 Major Lubin Maxwell, BDF’s Building Rehabilitation Projects Manager, explained that the home accessibility project’s main aim was to convert one of the existing bedrooms into an indoor bathroom. The project commenced on 11 June 2018, and during the transformation works, the project teams provided improved outdoor accessibility to the home, clean and secure immediate environs, in addition to providing other remedial works. Chief of Staff presents Mr Eustace Forde with the keys to his remodeled home as Major Maxwell looks on. World Bedding & Furniture Inc.